We know we have achieved our goal when a product or brand has won over the hearts of Mr and Mrs Switzerland and made its way into their shopping basket. First we need to detect any gaps in the market, and any customer needs that are not being satisfied. Once we have found a niche, then the new product has a good chance of success in Switzerland. Here are some of our success stories so far. Mr and Mrs Switzerland like to barbecue bratwurst-sausages or the ever-popular cervelat-sausages. Schlangenbrot (bread twisted round a stick) is also a barbecue favourite. Swiss people also like to toast cheese over a campfire. But would they also enjoy toasting marshmallows? We asked ourselves this question in 2009. “Rocky Mountain Marshmallows” – the original from the USA – is the most popular toasted marshmallow in the world. We took over the import of the brand, including the responsibility for marketing in Switzerland. Today the product is on sale at Coop, Migros, Manor, Globus, Jelmoli and many other retailers. Swiss people found out how tasty toasted marshmallows could be at our many diverse events and tastings. A great number of consumers took part in the barbecue competition in 2010, trying to win a popular barbecue brazier. Further barbecue events are planned. 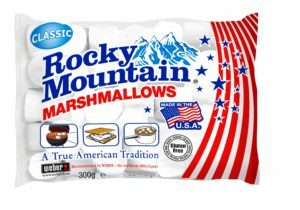 We import “Rocky Mountain” mini-marshmallows also during winter: a treat to be enjoyed with hot chocolate, and a combination that is not very well known in Switzerland. Shall we make a bet to see if we can change that? You do not need your own branding to have a successful product launch. Our brand “Lüscher Cake” is well known on the Swiss and Austrian market. Our cakes bases, pita bread and bagels are only a few examples of the success of our premium products. Are you interested in cooperating in this area? Then just get in touch with us. We look forward to hearing from you! Hatten die Schweizerinnen und Schweizer auf ein weiteres Fruchtbonbon im Süssigkeitenregal gewartet? Bei der grossen Mehrheit war das wahrscheinlich nicht der Fall. Trotzdem waren wir 2004 überzeugt davon, eine Erfolgsgeschichte schreiben zu können. Viele „Jelly Belly Beans“-Fans hatten sehnsüchtig darauf gewartet, die farbigen Fruchtbonbons-Beans endlich auch in der Schweiz kaufen zu können. Den Buyers der grossen Organisationen war die Süssigkeit bekannt. Die meisten Retailers hatten jedoch noch nie von diesen Beans aus Übersee gehört. Deshalb wollten wir das Original, die „Jelly Belly Beans“ nicht nur importieren, sondern sie auch richtig im Markt positionieren und vor allem ein gutes Fundament legen, auf dem wir weiter aufbauen konnten. Das begann mit einer gründlichen Marktanalyse. Danach wurden die Einkäufer unserer Partner (Grossverteiler, Detailhandel, Kioske, Candy-Shops) beraten. Sämtliche Anbieter von Süssigkeiten oder dem „American Lifestyle“ wurden über die Lancierung der „Jelly Belly Beans“ informiert. Die Verpackungsgrössen hatten wir den einheimischen Bedürfnissen anpassen lassen. Mit vielen Promotionen, Degustationen und Sponsorings, mit auffälliger Werbung und aussergewöhnlichen Verkaufsdisplays hatten wir die Marke bei der breiten Kundschaft bekannt gemacht. Die „Jelly Belly Beans“ eroberten erfolgreich die Schweiz. Und sie haben für uns eine Erfolgsgeschichte geschrieben. Bringing together what belongs together – that is our goal. We link up producers and consumers, as well as decision-makers on the production side and the decision-makers of our partners in retail or food-services. product opportunity • positioning • costing • packaging • marketing • distribution • presentation • communicating – this is what we do for all our partners. We adapt the baked goods and confectionery market according to supply and demand. Our cooperation with “Cake&Candy GmbH” will ensure your successful market entry and distribution success across Switzerland.